Understanding why so many people across the world are so poor is one of the central intellectual challenges of our time. This book provides the tools and data that will enable students, researchers and professionals to address that issue. Empirical Development Economics has been designed as a hands-on teaching tool to investigate the causes of poverty. The book begins by introducing the quantitative approach to development economics. Each section uses data to illustrate key policy issues. Part One focuses on the basics of understanding the role of education, technology and institutions in determining why incomes differ so much across individuals and countries. In Part Two, the focus is on techniques to address a number of topics in development, including how firms invest, how households decide how much to spend on their children’s education, whether microcredit helps the poor, whether food aid works, who gets private schooling and whether property rights enhance investment. A distinctive feature of the book is its presentation of a range of approaches to studying development questions. 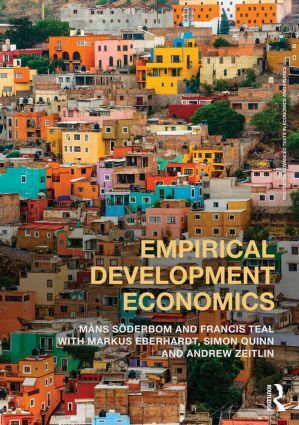 Development economics has undergone a major change in focus over the last decade with the rise of experimental methods to address development issues; this book shows how these methods relate to more traditional ones. How can the processes of development best be understood?